A short biography of anarchist and guerrilla leader Nestor Makhno, who led the anarchist Insurrectionary Army of the Ukraine, known as the Makhnovist movement. This movement was the manifestation of the Russian Revolution of 1917 in the Ukraine, where it took a libertarian form and where the workers and peasants fought both the counter-revolutionary Tsarist armies and the authoritarian Bolsheviks. The Makhnovist movement was named after Nestor Makhno, a Ukrainian anarchist who played a key role in the movement from the start. Indeed, Makhnovshchina literally means "Makhno movement" and his name is forever linked with the revolution in the South-East of the Ukraine. So who was Makhno? Nestor Ivanovich Makhno was born on the 27th of October, 1889 in Hulyai Pole, a town in the south east of the Ukraine of about 30,000 people with several factories and schools. Makhno was the son of a poor peasant family. His father died when he was ten months old, leaving him and his four brothers in the care of their mother. Due to the extreme poverty of his family, he had to start work as a shepherd at the age of seven. At eight he started to attend the Second Hulyai Pole primary school in winter and worked for local landlords during the summer. He left school when he was twelve and took up full-time employment as a farmhand on the estates of nobles and on the farms of the German colonist kulaks (rich peasants). At the age of seventeen, he started to work in Hulyai Pole itself, first as an apprentice painter, then as an unskilled worker in a local iron foundry and, finally, as a founder in the same establishment. It was when he was working in the iron foundry that he became involved in revolutionary politics. In the stormy years following the 1905 Russian Revolution, Makhno got involved in revolutionary politics. This decision was based on his experiences of injustice at work and seeing the terror of the Russian regime during the 1905 events (in Hulyai Pole there had been no serious disorder, yet the regime sent a detachment of mounted police to suppress gatherings and meetings in the town, terrorising the population by whipping those caught in the streets and beating prisoners with rifle butts). In 1906, Makhno decided to join the anarchist group in Hulyai Pole (which had been formed the previous year and consisted mainly of sons of poorer peasants). At the end of 1906 and in 1907, Makhno was arrested and accused of political assassinations, but was released due to lack of evidence. In 1908, due to the denunciation of a police spy within the anarchist group, he was arrested and put in jail. In March, 1910, Makhno and thirteen others were tried by a military court and sentenced to death by hanging. Due to his youth and the efforts of his mother, the death penalty was commuted to life imprisonment with hard labour. He served his time at the Butyrki prison in Moscow, resisting the prison authorities by every means available to him. Due to this resistance, he spent much of his time in chains or in damp and freezing confinement. This experience ensured that Makhno developed an intense hatred of prisons (later, during the revolution, his first act in entering a town or city was to release all prisoners and destroy the prison). It was during his time in Butykri that Makhno met Peter Arshinov, a fellow anarchist prisoner and later activist and historian of the Makhnovist movement. Arshinov was born in 1887 in the Ukrainian industrial town of Katerinoslav. His father was a factory worker and he was a metal worker. Originally a Bolshevik, he had become an anarchist in 1906, taking a leading part in organising factory workers and actions against the regime. In 1907 he was arrested and sentenced to death, escaping to Western Europe. In 1909, he returned to Russia and was again arrested and again escaped. In 1910, he was arrested and placed in the Butykri prison where he met Makhno. The two anarchists established a close personal and political friendship, with Arshinov helping Makhno develop and deepen his anarchist ideas. 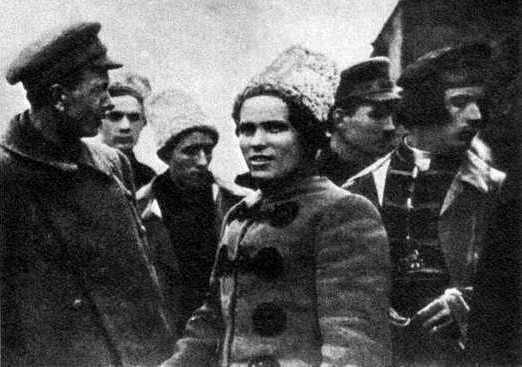 On March 2nd, 1917, after eight years and eight months in prison, Makhno was released along with all other political prisoners as a result of the February Revolution. After spending three weeks in Moscow with the Moscow anarchists, Makhno returned to Hulyai Pole. As the only political prisoner who was returned to his family by the revolution, Makhno became very well-respected in his home town. After years of imprisonment, suffering but learning, Makhno was no longer an inexperienced young activist, but a tested anarchist militant with both a powerful will and strong ideas about social conflict and revolutionary politics - ideas which he immediately set about applying. Once home in Hulyai Pole, Makhno immediately devoted himself to revolutionary work. The remaining members of the anarchist group, as well as many peasants, came to visit him. After discussing ideas with them, Makhno proposed beginning organisational work immediately in order to strengthen links between the peasants in Hulyai Pole and its region with the anarchist group. On March 28-29, a Peasant Union was created with Makhno as its chairman. Subsequently, he organised similar unions in other villages and towns in the area. Makhno also played a large part in a successful strike by wood and metal workers at a factory owned by his old boss (this defeat led to the other bosses capitulating to the workers as well). At the same time, peasants refused to pay their rent to the landlords. Regional assemblies of peasants were called, both at Hulyai Pole and elsewhere, and on August 5-7, the provincial congress at Katerinoslav decided to reorganise the Peasant Unions into Soviets [councils] of Peasants' and Workers' Deputies. In this way, "Makhno and his associates brought socio-political issues into the daily life of the people, who in turn supported his efforts, hoping to expedite the expropriation of large estates." In Hulyai Pole, the revolution was moving faster than elsewhere (for example, while the Aleksandrovsk soviet supported the actions of the Provisional Government during the July days in Petrograd, a meeting in Hulyai Pole saluted the rebellious soldiers and workers). Peasants were drawn to Hulyai Pole for advice and help from the neighbouring volosts (administrative districts). The peasantry wanted to seize the land of the large landowners and the kulaks. Makhno presented this demand at the first sessions of the regional Soviet, which were held in Hulyai Pole. In August, Makhno called all the local landlords and rich peasants (kulaks) together and all documents concerning ownership (of land, livestock and equipment) were taken from them. An inventory of this property was taken and reported to the session of the local soviet and then at a regional meeting. It was agreed that all land, livestock and equipment was to be divided equally, the division to include the former owners. This was the core of the agrarian program of the movement, namely the liquidation of the property of the landowners and kulaks. No-one could own more land than they could work with their own labour. All this was in flat defiance to the Provisional Government which was insisting that all such questions be left to the Constituent Assembly. Free communes were also created on ex-landlord estates. Unsurprisingly, the implementation of these decisions was delayed because of the opposition of the landlords and kulaks, who organised themselves and appealed to the provisional authorities. When General Kornilov tried to march on Petrograd and take power, the Hulyai Pole soviet took the initiative and formed a local "Committee for the Salvation of the Revolution" headed by Makhno. The real aim was to disarm the potential local enemy - the landlords, capitalists, and kulaks - as well as to expropriate their ownership of the people's wealth: the land, factories, plants, printing shops, theatres and so on. On 25 September a volost congress of Soviets and peasant organisations in Hulyai Pole proclaimed the confiscation of the landowners' land and its transformation into social property. Raids on the estates of landlords and rich peasants, including German colonists, began and the expropriation of the expropriators began. Makhno's activities came to a halt the following spring when Vladimir Lenin's government signed the Treaty of Brest-Litovsk. This treaty gave sizeable parts of the Russian Empire, including the Ukraine, to Germany and Austria in return for peace. The Treaty also saw the invasion of the Ukraine by large numbers of German and Austrian troops, who conquered the entire country in less than three months. Makhno succeeded in forming several military units, consisting of 1,700 men, but could not stop Hulyai Pole being taken. After an anarchist congress at the end of April in Taganrog, it was decided to organise small combat units of five to ten peasants and workers, to collect arms from the enemy and to prepare for a general peasant uprising against the Austro-German troops and, finally, to send a small group to Soviet Russia to see at first hand what was happening there to both the revolution and to the anarchists under Bolshevik rule. Makhno was part of that group. By June, Makhno had arrived in Moscow. He immediately visited a number of Russian anarchists (including his old friend Peter Arshinov). The anarchist movement in Moscow was cowed, due to a Cheka (Bolshevik secret service) raid in April which broke the backbone of the movement, so ending a political threat to the Bolsheviks from the left. To Makhno, coming from an area where freedom of speech and organisation was taken for granted, the low level of activity came as a shock. To him, "Moscow appeared as 'the capital of the Paper Revolution,' a vast factory turning out empty resolutions and slogans while one political party, by means of force and fraud, elevated itself into the position of a ruling class." Makhno also visited famous anarchist Peter Kropotkin, asking his advice on revolutionary work and the situation in the Ukraine. "The peasants understood this slogan in their own way. According to their interpretation, all power, in all areas of life, must be identified with the consciousness and will of the working people. The peasants understand that the soviets of workers and peasants of village, country and district are neither more nor less than the means of revolutionary organisation and economic self-management of working people in the struggle against the bourgeoisie and its lackeys, the Right socialists and their coalition government." "But I must tell you, comrade Lenin, that your assertion that the anarchists don't understand 'the present' realistically, that they have no real connection with it and so forth, is fundamentally mistaken. The anarchist-communists in the Ukraine . . . the anarchist-communists, I say, have already given many proofs that they are firmly planted in 'the present.' The whole struggle of the revolutionary Ukrainian countryside against the Central Rada has been carried out under the ideological guidance of the anarchist-communists and also in part by the Socialist Revolutionaries . . . Your Bolsheviks have scarcely any presence in our villages. Where they have penetrated, their influence is minimal. Almost all the communes or peasant associations in the Ukraine were formed at the instigation of the anarchist-communists. The armed struggle of the working people against the counter-revolution in general and the Austro-German invasion in particular has been undertaken with the ideological and organic guidance of the anarchist-communists exclusively. "Certainly it is not in your party's interest to give us credit for all this, but these are the facts and you can't dispute them. You know perfectly well, I assume, the effective force and the fighting capacity of the free, revolutionary forces of the Ukraine. It is not without reason that you have evoked the courage with which they have heroically defended the common revolutionary conquests. Among them, at least one half have fought under the anarchist banner. . .
"All this shows how mistaken you are, comrade Lenin, in alleging that we, the anarchist-communists, don't have our feet on the ground, that our attitude towards 'the present' is deplorable and that we are too fond of dreaming about the future. What I have said to you in the course of this interview cannot be questioned because it is the truth. The account which I have made to you contradicts the conclusions you expressed about us. Everyone can see we are firmly planted in 'the present,' that we are working and searching for the means to bring about the future we desire, and that we are in fact dealing very seriously with this problem." The Bolsheviks helped Makhno to return to the Ukraine. The trip was accomplished with great difficulty. Once Makhno was almost killed. He was arrested by Austro-German troops and was carrying libertarian pamphlets at the time. A Jewish inhabitant of Hulyai Pole, who had know Makhno for some time, succeeded in saving him by paying a considerable sum of money for his liberation. Once back in Hulyai-Pole, he started to organise resistance to the occupying forces of the Austro-Germans and their puppet regime led by Hetman Skoropadsky. With the resistance, the Makhno movement can be said to have arisen. From July 1918 to August 1921, Makhno led the struggle for working class freedom against all oppressors, whether Bolshevik, White (counter-revolutionary) or nationalist. During the course of this struggle, he proved himself to be "a guerrilla leader of quite outstanding ability." After the defeat of the Makhnovist movement in 1921, Makhno was exiled in Western Europe. In 1925 he ended up in Paris, where he lived for the rest of his life. While there, he remained active in the anarchist movement, with the pen replacing the sabre (to use Alexander Skirda's colourful expression). Makhno contributed articles to various anarchist journals and in particular to Dielo Truda (Voice of Labour), an anarchist-communist paper started in Paris by Peter Arshinov (many of these articles have been published in the book The Struggle Against the State and Other Essays). He remained active in the anarchist movement to the end. Makhno's most famous activity in exile was his association with, and defence of, the Organisational Platform of the Libertarian Communists (known as the "Platform"). The Platform was an attempt to analyse what had gone wrong in the Russian Revolution and suggested a much tighter anarchist organisation in future. This idea provoked intense debate after its publication, with the majority of anarchists rejecting it. This debate often resulted in bitter polemics and left Makhno somewhat isolated as some of his friends, like Voline, opposed the Platform. However, he remained an anarchist to his death in 1934. Makhno died on the morning of July 25th and was cremated three days later and his ashes placed in an urn within Père Lachaise, the cemetery of the Paris Commune. Five hundred Russian, French, Spanish and Italian comrades attended the funeral, at which the French anarchist Pierre Besnard and Voline spoke (Voline used the occasion to refute Bolshevik allegations of anti-Semitism). Makhno's wife, Halyna, was too overcome to speak.